iFLY Phoenix has opened to the public as of January 28th, 2017. The tunnel is a 14 foot diameter, tall model similar to the first of its kind found in Texas at iFLY Austin. 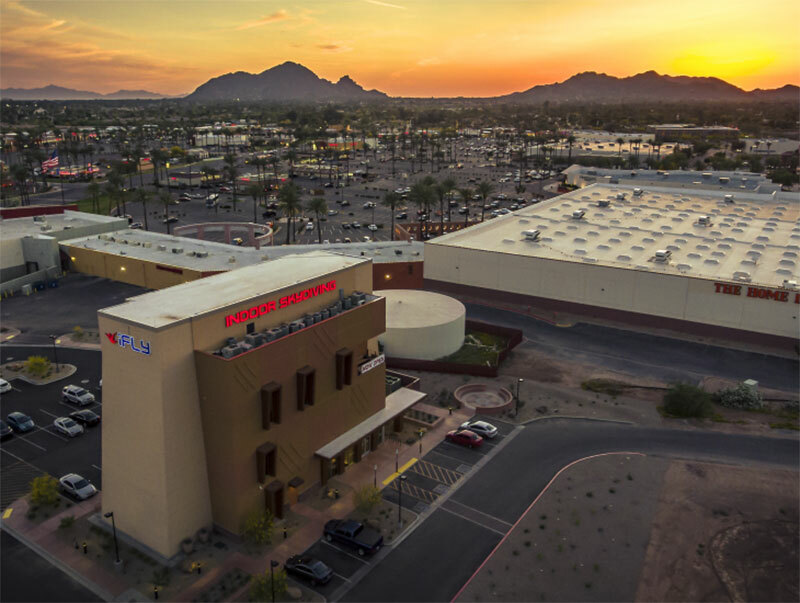 iFLY World has built their first Arizona based indoor skydiving facility at the The Pavilions At Talking Stick Shopping Center in Scottsdale, Arizona. The wind tunnel is to join the expanding shopping center development. Notable in this development is the cancellation of the Fliteshop project which was due to sit less than 2 miles to the north in the OdySea in the Desert development. Average rating of 4.2 from 16 review(s). I had trouble finding “I fly” - it’s in a very obscure location- so was 5 minutes late. The young girl who checked me in very rudeIy stated that you I was told to come 15 minutes early (I wasn’t) and that I should have called to get directions if I was lost. obnoxious and unnecessary. After my first flight, I was offered a great price on a return flight. I bought a 6-flight return package and was told I could split it up anyway I wanted. Upon my return I was told it was 2-person max. Completely disappointed. This is an amazing experience, but don’t get scammed by the return flight package. 8 year old granddaughter’s birthday party there was great. The staff was attentive and the party room was relaxing and accommodating with plates, napkins, and drinks. The girls were happy and excited to get two turns each of “flying” and got to choose a photo and a video of their “flight”. Worthwhile if one can afford the experience. Great time. This was my second trip to IFly Phoenix. Instructor Amberly was upbeat and professional. The instructors do a nice job in helping you refine your "flying" abilities inside the tunnel. There was a team spirit among the flyers waiting their turn as high fives were hit after each person's flight. I hope to return soon and practice turns. I recommend buying a return flight voucher following your flight if you plan on returning. It is about half the cost of your first flight. Short amount of time for an expensive flight. I experienced a cheaper rate both in California in two separate locations two separate dates. Hopefully more customers will take advance of this experience at a responsible cost. My grandkids, 12 and 15, were a bit hesitant as to what to expect. One will try anything and one is cautious and has to check things out thoroughly before trying anything new. After their 2 flights they were beaming from ear to ear. When asked how they liked it both responded with an overwhelming "AWESOME". Can't wait to go again. Very friendly and knowledgeable staff. Very exciting entertainment and gives me goals to work on and new stuff to learn. I wish I could go once or twice a month. I took my Fred Astaire professionals and we had an amazing time! Staff were incredible. My Daughter Couldn't Stop Grinning!!! At the end of her Spring Break I surprised my 13 year old daughter with a trip to iFLY. We got there well before her flight time, and after receiving her instructions and suiting up she was eager to go. She had two turns in the tunnel, the second one took her very high up, and the whole time she was grinning from ear to ear!! She LOVED it. If you are an adventurer or just have adventurous kids, take them-it's really worth it, your kids will love it. My daughter can't wait to go again!! Everyone I talked to was nice and friendly. Our instructor was knowledgeable and helpful. Flying in the wind tunnel is so exciting and fun, we will definitely be coming back. I already got more flights for return visits. Seriously some of the funniest and nicest staff I have met at a public place! Super chill vibe, very organized and laid back, great prices!! Definitely get out and try this SO BADASS!